Soy Pillar Candles are the best choice for anyone wanting a clean-burning, long-lasting candle that smells wonderful and doesn't release soot or toxins. Friendly Fumes soy pillar candles are individually hand-poured and made from pure soy wax sourced from American soybean farmers. We use only real, natural botanical oils for our scents, and our wicks are metal-free, cored with sturdy hemp and braided with unbleached cotton also sourced from American farmers. 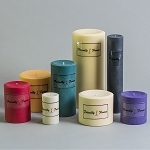 Friendly Fumes Round Pillars are made from All Natural soy wax. Candles are 95% soot free, clean burning, and are maximum scented with a perfect burn pool. Friendly Fumes Square Pillars are made from All Natural soy wax. Candles are 95% soot free, clean burning, and are maximum scented with a perfect burn pool. Dye-free or white coloring is recommended. At Friendly Fumes, our integrity and that of our products are a top priority, and our soy pillar candles are of the highest quality available on the market today. Due to the purity of our ingredients, our soy pillar candles can last twice as long as paraffin pillars and beautifully diffuse their fragrance throughout your home without being overwhelming or spreading impurities. We have a “scent library” of almost 300 fragrances, including florals, sweet citruses, woodsy musks and more. Our soy pillar candles also come in a variety of colors to complement your décor, as well as a dye-free and unscented option when you simply want a warm, luxurious ambiance with no added scent. No matter your favorite color or fragrance, you are sure to find your favorite candle to burn any time of the day and in any room. Our soy pillar candles burn clean, tunneling right down the center to avoid messy drips. The other benefit of soy wax is that cleanup is simple, so even if you do happen to spill some hot soy wax, you'll only need soap and water, as soy wax is far easier to get out of carpets and upholstery than petroleum-based waxes. If you're looking for the perfect candle to add elegance and lovely fragrance to your home, Friendly Fumes soy pillar candles are the high-quality, pure, natural candles you are looking for.Soy Pillar Candles are the best choice for anyone wanting a clean-burning, long-lasting candle that smells wonderful and doesn't release soot or toxins. Friendly Fumes soy pillar candles are individually hand-poured and made from pure soy wax sourced from American soybean farmers. We use only real, natural botanical oils for our scents, and our wicks are metal-free, cored with sturdy hemp and braided with unbleached cotton also sourced from American farmers. If you're looking for the perfect candle to add elegance and lovely fragrance to your home, Friendly Fumes soy pillar candles are the high-quality, pure, natural candles you are looking for. Friendly Fumes soy pillar candles are individually hand poured with pure soy wax sourced from American soybean farmers, and real botanical oils. Soy pillar candles stand out from paraffin and other alternatives because soy wax burns cleaner and at a cooler temperature, making for a long-lasting burn that doesn't send a haze of soot and toxic chemicals into the air. Soy pillar candles can sometimes last twice as long as paraffin pillars.We put the same integrity into the wicks as we do in the wax. Our wicks are cored with sturdy hemp, never metal, and braided with U.S. grown, unbleached cotton. The quality of the wick matches the purity of the wax to extend the life of the candle, and diffuse fragrance through your home in a way that's strong, but never overwhelming. Choose your favorite scent from our "scent library" of almost 300 fragrances! You'll find florals, sweet citruses, woodsy musks and more. Our richly scented soy pillar candles add a touch of elegance to any room. Choose colors that compliment your décor, or go dye-free and unscented to create a warm, luxurious ambiance with no frills and no fuss. Our soy pillar candles burn clean, tunneling right down the center to avoid unwanted drips and spills. But if you do happen to spill a little hot soy wax, you can clean it up in a pinch with just a little soap and water. It's also easier to get out of carpets and upholstery than petroleum-based waxes. For the highest quality, purest soy pillar candles, you've come to the right place.